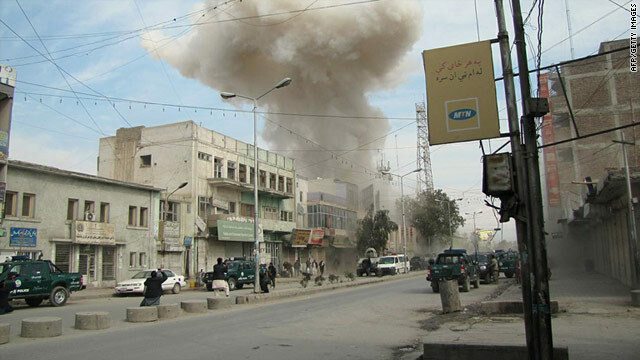 Smoke rises from a branch of Kabul Bank in Jalalabad after an attack by three Taliban suicide bombers, February 19, 2011. Kabul, Afghanistan (CNN) -- The death toll from an insurgent attack on a bank in eastern Afghanistan rose on Sunday, with at least 38 people killed, including 13 policemen, a spokesman for the Interior Ministry said. Saturday's incident also left 41 people wounded, including 14 police officers, said Najib Nekzad. The attackers stormed a branch of the Kabul Bank in Jalalabad, the provincial capital of Nangarhar. Four of them were killed and a fifth was arrested, Nekzad said. The NATO command in Afghanistan said reports indicated that it might have been a suicide attack. It issued a statement saying three people apparently entered the bank wearing suicide vests and detonated themselves. We hope the grieving hearts of those who have lost loved ones, as well as the injuries of those who survived the attack, heal quickly. Fighting between insurgents and security forces lasted for more than four hours, said Ahmadzia Abdulzai, a spokesman for the provincial governor. An eyewitness said some civilians were taken hostage. The attackers "blatantly targeted Afghan civilians" in a "truly vile attack," said Rear Adm. Vic Beck, a spokesman for NATO's International Security Assistance Force. "We hope the grieving hearts of those who have lost loved ones, as well as the injuries of those who survived the attack, heal quickly. We will continue working with the Afghan government in bringing those responsible to justice." Afghan President Hamid Karzai condemned the attack, which came a day after militants launched two other assaults, killing 14 people in the eastern region of the country. The U.S. Embassy in Kabul on Saturday issued a statement condemning the Friday bombings, which occurred in Khost and Nangarhar provinces. The Khost incident killed 11 people and wounded 41 others, said Abdul Hakim Esaqzai, a spokesman for the provincial governor. Women and children were among the wounded and the powerful blast destroyed vehicles. The attack in Nangarhar province Friday killed three police officers, the embassy said. "The United States condemns in the strongest terms the suicide bombing yesterday in Khost province and roadside bomb attack in Nangarhar," an embassy statement said. "The United States will continue to stand with our Afghan partners as they defend themselves against terrorism and build a more peaceful future." Khost and Nangarhar border Pakistan, where al Qaeda and Taliban militants have a strong presence. CNN's Matiullah Mati and Phil Black contributed to this report.